When we got to our meeting place one of the children told us that we wouldn’t be worshiping under the trees anymore. She said that we would go and have worship in a snooker hut that belongs to her dad. The Solomon Islands lie between Papua New Guinea and Fiji. The country is made up of about 30 islands and many atolls (coral outcroppings). Because they lie near the equator, the islands are hot and humid. The main islands of the Solomon Island group are volcanic mountains. English is the official language, but 80 local languages, including Pidgin, are spoken throughout the country. Only about half the people can read. Most of the people living in the Solomon Islands are of Melanesian descent, and most depend on farming and fishing for their livelihood. My name is Ngatia Rezelda Apa. I am 11 years old and in grade six. 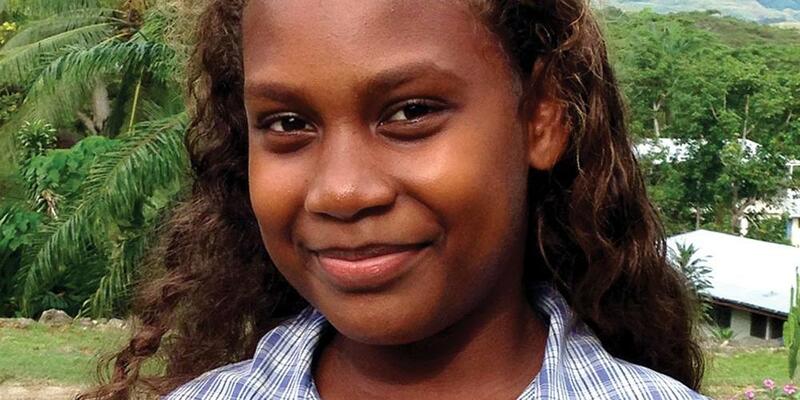 I live at Betikama Adventist College in the Solomon Islands, where my dad works as a teacher. Here at the Betikama church the children’s ministry department looks after the children and organizes programs that help to nurture our lives to follow in the steps of our great Teacher—Jesus—our Leader, Guide, Captain, and Friend. Of all the days of the week I love Sabbath the best because that’s when, early in the morning, we children and our leaders walk to a nearby neighborhood to share Jesus with the children there. I love to tell the children stories from the My Bible Friends books. Watching them enjoy the stories, songs and prayer gives me greater joy inside and makes me realize that I’m receiving a double portion of blessings that come to those who keep the Sabbath holy. The first time we went to this place we had only six children and we had our worship under the shade trees. We prayed with them, sang songs and told Bible stories. The children were so excited and keen to learn more about Jesus. Every Sabbath our little group would meet, and each time there would be an increase in the number of children coming to worship with us. Now we have at least 16 children (often more), with a few of their parents now coming to worship with us. Everything was going well until one particular Sabbath. When we got to our meeting place one of the children told us that we wouldn’t be worshiping under the trees anymore. She said that we would go and have worship in a snooker hut that belongs to her dad. When we got to the snooker hut there were drunken men still lying around in the hut from the night before, but the owner said, “It’s OK.” Then he went on waking up all of the hung-over drunken men. They finally woke up and got to worship with us that morning, and we were more than happy to share Jesus with the children who came as well as the drunken men. From that Sabbath on we have been worshiping in the snooker hut with not only the children but with their parents who are coming to listen to the messages that we share about God’s love in the songs and Bible stories. We pray that God will keep on using us as vessels to share His love with other children so that they too may one day give their lives to Jesus and be ready to meet Him when He comes in glory to gather His precious jewels home. My earnest desire is that we may be found ready to go home and spend eternity with Him.